The waters of Istria in the Adriatic Sea are littered with ships from the First World War and one of the best known is that of the Rossarol, sunk on 16 November 1918. Divers from many parts of Europe have developed a project to remember the tragic episode and safeguard the integrity of the wreck. The Italian scout cruiser Cesare Rossarol was a Poerio-class ship built at the Gio. Ansaldo & C. shipyard in Sestri Ponente. Entered into service on 1 August 1915, the Rossarol was actually a slender destroyer, 85m long and 8m wide. One of the problems with the proverbial bucket list is that whenever you tick a dive trip off the list, it seems that you add at least three more destinations to it. This is exactly what happened to me. 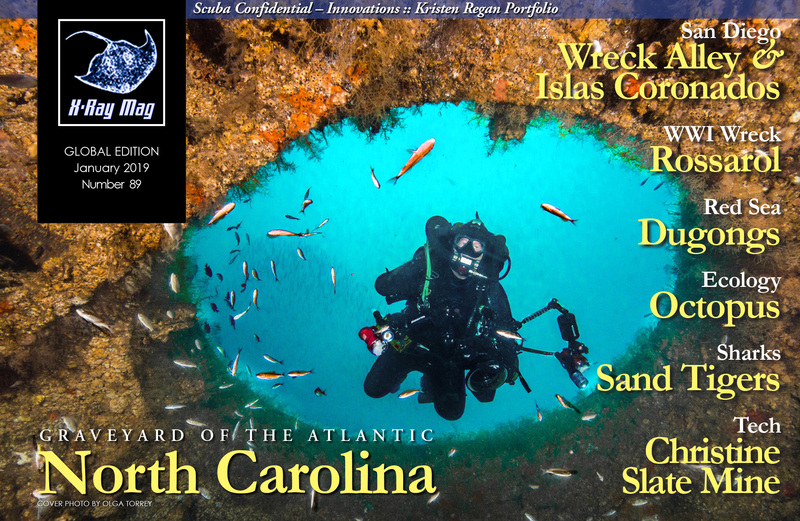 I had never considered North Carolina as a dive destination, much less one of the top wreck diving locations in the world. Wreck diving is one of my favorite types of diving because I love the history of how the wrecks came to be underwater, and North Carolina has plenty of that. Ever wanted to know how a photographer captured a fantastic, unique or strangely weird shot? Well, here are the favorite image picks and their backstories from several of our featured contributors, as we celebrate the new year and look back on dive adventures past. We are all involved in the same great sport. Whether you are a recently qualified open water diver or an experienced diver who has travelled to the farthest oceans of the world, there is a bond that connects us. We are all divers. In her Plastisphere series, American artist and photographer Kristen Regan has created spell-binding photographs of plankton forms, inspired by microscopic ocean life, using repurposed plastic materials. The waters off the coast of the US state of North Carolina are treacherous. Bad weather, rough seas, heavy current and inlets that are difficult to navigate are common. So why do underwater explorers consider this area to be a world-class dive destination? Because when you do get offshore, it is extraordinary. Visibility varies but can be more than 30m (100ft). The best diving conditions are between June and October, with late June to early August being the best. San Diego’s Wreck Alley is an area with intentionally sunken ships. One of the wrecks divers can find here is the HMCS Yukon, which was a Mackenzie-class destroyer that served in the Royal Canadian Navy (RCN) and later the Canadian Forces. There I was, off the coast of North Carolina at a depth of about 20m (60ft) when the shadowy shape of the WWII wreck Caribsea came into view—but it looked almost as if it was moving! Upon closer inspection, it turned out to be a cloud of tiny bait fish completely covering the wreck. As they moved, the ship seemed to move with them; and then, out of the swarm, a massive, tank-like, gray silhouette emerged. Many years ago, whilst learning to scuba dive, I came across an article on manatees and dugongs. I was entranced. Not only were they cute, according to the article, they loved hugging divers, and once they held on to you, they did not want to let you go. The image of this human-hugging, underwater teddy bear remained with me and I was determined that one day, I would find one and hug it. I started to research these creatures and discovered that manatees and dugongs were not actually the same animal. Although they belong to the same family (Sirenia), they are actually quite different. Talking about this animal is simply a pleasure, almost as much as meeting it and relating to it underwater. It is satisfying to spend some time putting my thoughts into words about the octopus, as I am a diver in love with this extraordinary creature—a mollusc that reasons. Right-click on the download link and save the pdf to your desktop / hard drive and open it from there. This will enable you to view the magazine as it was designed: Full screen and without borders and rid of limiting viewports. Opening and viewing X-Ray Mag from within a browser window not only makes it smaller and harder to read but some browsers often produces weird colour shifts and funky hues. Known to cause problems: Using an outdated Acrobat Reader may cause some images to go blank. Version 7 or newer is required.